Posted on the Feast of the Most Precious Blood of Jesus Christ, July 2018. Yesterday (Sat. 23 June, 2018) I was shocked!!! REALLY SHOCKED!!! I didn’t expect this to happen so close to home; ‘in our own backyard’, so to speak. When I first received an email from a fellow Catholic, I thought it couldn’t be true. It stated that a new R.E (Religious Education) Curriculum was to be introduced into Catholic Schools in our diocese to children in upper primary and high school ( i.e; from 11-18 years of age). “Just want to let you know a good priest was at the teachers & principals meeting in … Diocese recently where the new R.E Curriculum to be implemented was discussed and he had to stand up and defend the Catholic Belief at the Heart of The Faith: that Jesus is really, truly and substantially present in the Blessed Sacrament. Reading the link* (see below) that she sent me, it seems they had been working on this for over a year. I remembered a former parishioner of ours who left the diocesan Catholic Education Office and deliberately got a new job in a new diocese a few months ago. He didn’t like what was happening (but he couldn’t tell us at the time). 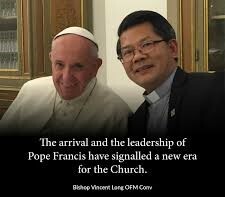 At least he has a very good bishop where he is now! The event described above, has since been verified to me today (1 July) by another parishioner who heard of this meeting through her own contacts. I did a search online but could not find the R.E Curriculum . Another (teacher) source said that it has not yet been “released or published for staff”. The Bishop of the diocese directing this development, was chosen by Bergoglio when the former bishop was elevated to Archbishop -to replace the cardinal of a neighbouring diocese who was called to Rome. This is another attack on the Eucharist! Now we are told, and our children are to be taught – that the True Presence is only symbolic – Jesus is not truly present. Also that the miracles written about in the Gospels, are only literary devices!! *Read about this new curriculum and its inception as a research project here. The article was written over a year ago. The final attack on the Eucharist will probably arrive with the changes to the Mass which are now being planned. When the words of Consecration are changed to signify that the Eucharist implies communion with each other … then it will no longer be the Body of Christ. If children (and their parents) are being already taught that the Real Presence is not true and that it is merely symbolic, then the transition will be easy. It seems things are happening very fast – orchestrated in fact. In this country, we have had an inquiry into sexual abuse by priests and as a result there came an attack on the Seal of Confession, with a new law being passed. On June 18, 2018, it was reported in LifeSite News that Australian bishops remained defiant and said they would risk gaol rather than break the Sacred Seal of Confession to report sexual abuse. This is to be implemented from the end of March next year. On June 19, LifeSite News reported that the US Bishops’ Conference upheld the Church’s teaching on the ‘inviolability of the seal of confession’. It seems the Bishops are on the right track, but the laws our governments pass are a different story. Eucharist – Communion to adulterers; Communion to spouses of Catholics; Communion to Lutherans (as has happened at the Vatican) … and now the most vicious attack of all – that the presence of Jesus in the Eucharist is only symbolic! LifeSite News has articles on all these examples listed above. You will probably have read them during the past few years/months. Don’t expect it to stop soon! Don’t think that your children are safe from this new religious curriculum being introduced! Find out from your school’s principal whether they will be implementing this curriculum. (I don’t think they will have a say). It will be mandatory. Spread the news to other parents. Don’t expect to see an article in your local diocesan newspaper regarding such a change (or at least not one that explains the Truth). Find out if an adjoining Diocese (that is easily accessible in terms of transport), with a more conservative Bishop, is easily accessible. Move your family to a diocese that is “safe”, but do your homework first, and remember, that bishops can change. Be ready to home-school. Make inquiries to find out about other Catholic home-schooling groups in your diocese. As far as our diocese is concerned, there are plenty of home-schooling groups, with lots of support. “…The reign of those who wish to destroy the word of God has commenced and the times for all those prophecies, as foretold to Daniel and John, are upon you. “…I will ensure that My church, those who adhere to My Teachings, My Sacraments and the Word of God, lives on through the remnant who will never desert me. There will be those amongst you who will betray me today. Others amongst you will soon denounce my sacraments, as you will be too weak to defend the Word of God.